Our lad John P. Dwyer has been lancing eardrums with Thee Oh Sees in an ever escalating flurry of records for the past 6 years. Since the release of "The Master's Bedroom Is Worth Spending A Night In" announced a new loud era and excepting a few momentary detours into home-baked territory ("Dog Poison" and "Castlemania" for example), JPD and company have pummeled a bit harder each time out, cemented their reputation as a live force to be reckoned with, and have left legions sweaty and bruised in the process. Late last year, after years of relentlessly touring the world, the word got out…Dwyer's moving to LA (fear not, still California!) 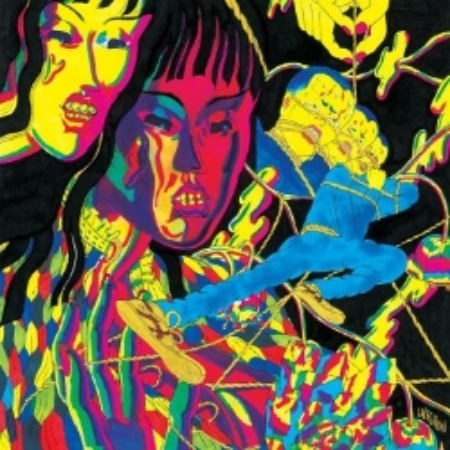 and Thee Oh Sees are taking a much needed hiatus with a shifting of gears ahead and a new album on the way. This is that album. Drop was recorded in a banana ripening warehouse (no joke) with hair-farming studio warlock Chris Woodhouse playing drums and graced with the presence of talented gurus Mikal Cronin, Greer McGettrick, and Casafis adding horns and vocals. The result pushes the familiar polarities of the group farther outward than ever before…opener "Penetrating Eye" might be the heaviest Oh Sees song yet, "Transparent World" and "Put Some Reverb On My Brother" foam with seasick fuzz, and yet the ballads, like the harpsichorded "King's Nose" and the lush and stately closer "The Lens", extend their oeuvre into mellotronic, far-out pop with delicacy and grace. This schizophrenia heralds the man and the band into an unseen future in classic Dwyer fashion - with restless energy harnessed into exquisitely crafted jams, with an emphasis on the pensive and the paranoid in turns. Featuring artwork by Jonny Negron.